Th-INK-ing of You: So Grateful for You! Hello friends! I hope you are all doing well and enjoying this beautiful time of year! Today we are taking a look back at the Sept. 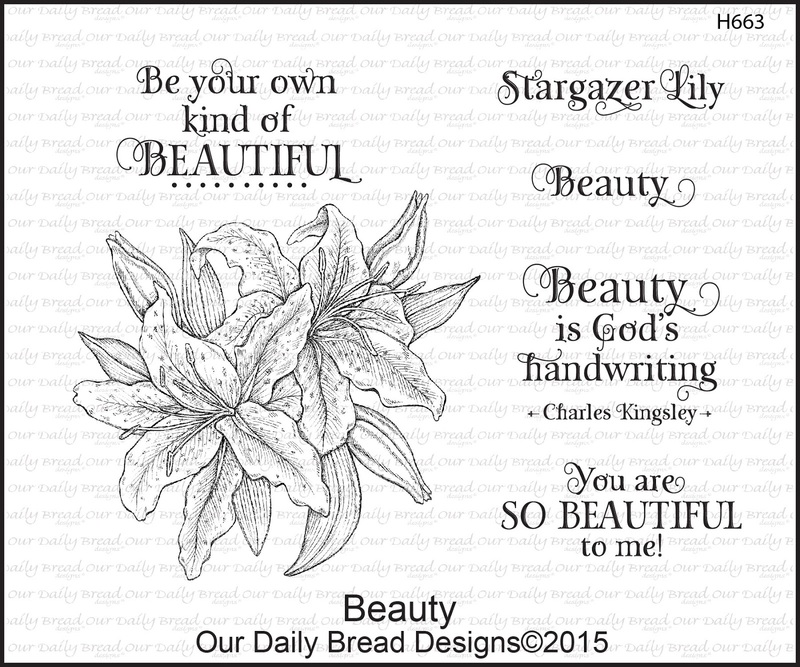 Mid Month release at Our Daily Bread Designs. I just can't get enough of this gorgeous image from the Beauty set, and with Thanksgiving just around the corner, this sentiment from Grateful seemed the perfect sentiment to go with it. Feeling a little touch of fall in the air, and seeing some leaves starting to change color already, I decided to deviate from the usual pinks of Stargazer Lilies and color up these lilies in more fall colors. I colored the image from Beauty with Copics and hand cut. 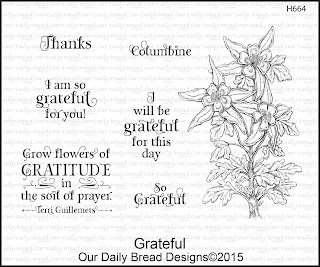 I added a flourish from the ODBD Custom Fancy Foliage die set, and I cut my sentiment, which is from the newly released Grateful set, with the small circle die in the Recipe Card and Tags die set, and matted with another die from that same set. I embossed and cut my vanilla layer with the ODBD Sunburst Background Die, and the green polka dotted paper is from a pack called Loolah, by Creative Imaginations. The flowers are popped up on dimensional tape. I chose this sentiment from the Grateful set because this is the season when we start to turn our hearts and minds to Thanksgiving, not only the "holiday" but thanksgiving for all God has blessed us with. My list of blessings is really endless, but among my most treasured blessings are each one of you... my blogging friends! You encourage me, uplift me, and just bless my life by visiting, and by your sweet comments. I thank God for YOU! May you be blessed in a special way today! Gorgeous, striking design!!! Love the color of the lilies, love the clean layout, love the background.....what a fabulous card!!! HUGS!! 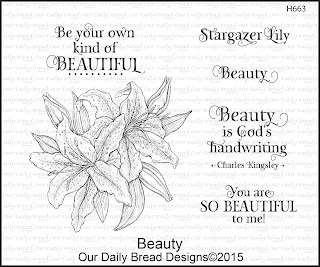 Your lilies are just gorgeous, Grace! Love this clean design with all the texture…very pleasing to the eyes! What a wonderful message on a stunning card creation! Hugs! Oh, Grace, this is stunning! The colors are amazing, and these are beautiful flowers against the embossing. Love it completely! Hugs! You really are getting some mileage out of these stamps Grace, and this is one of the most delightful cards I have seen - love the orange lilies contrasted with the green, and the elegant design of the whole. What a delightful card ! Great use of the beautiful stamps and love the colours you have chosen. What a beautiful card, Grace!! I just love the bright coloring of the lilies in orange and your layout with the starburst background. Gorgeous! Wonderful card, Grace! Orange is not a go to color for me but I really like your color choices on this one!!! I like your background choice too! Just a gorgeous card Grace! Your lilies are colored perfectly, well done!! Your layers all work well together; very pretty card! So beautiful....the coloring and the background are splendiferous! Beautiful card, lovely design, Grace!!! This is more like what our Sierra National Forest lilies look like! Love the orange color and your stitched sunburst is so cool behind it! Beautiful Grace! An Oct. Pre-Release Opportunity from ODBD! Welcome to the ODBD Mid Sept. Release! Welcome to the ODBD Sept. 1 Release!